Gluten Free Beat ®: This One's For You! You may have noticed I've been MIA... It's been for a good reason, I wouldn't just leave my gluten free folk hanging! I've decided to share, in part, because I need to -- and I think it may help others as a result. My heart's been aching with sadness, I've just lost my first and oh so beloved Chuckie. This is hands down one of the toughest losses I've gone through. 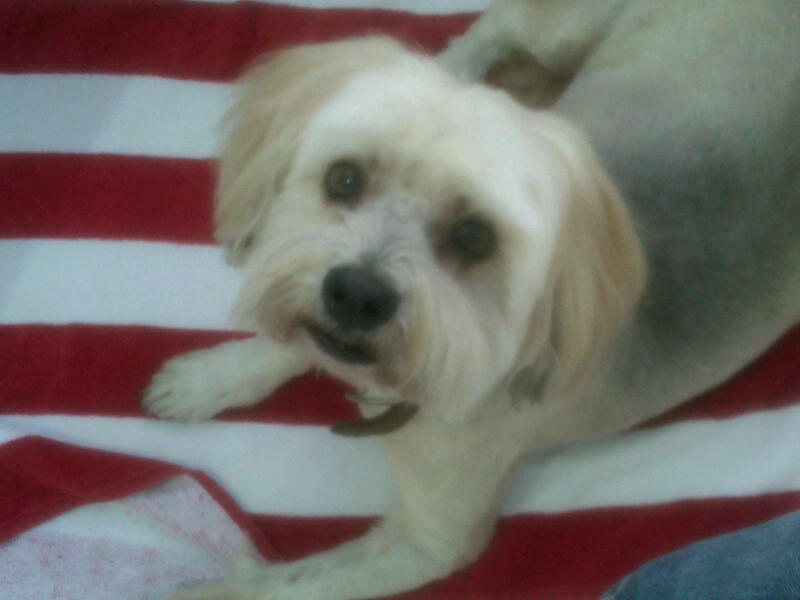 Hermoine had it right, Chuckie was no dog, he was as human as they come (in fact, way better than most humans...) he was my son. I've copied the letter I wrote and read to Chuckie before he passed, I hope some of you take the time to read it and learn how truly amazing Chuckalicious was. Chuckie taught me to love and cherish Islamorada the way he did. Chuckipoo's dad, grandparents and I took him to his final resting place(s) all over his favorite spots in Islamorada. Islamorada isn't only boobah (dog) friendly, it is extremely gluten free friendly as well - making it our perfect family vacation destination. 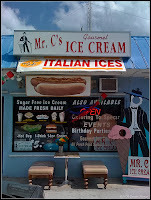 Chuckie had to stop at Mr. C's to get his favorite vanilla ice cream, and while we were there we had to partake as well! P.S. - Nutella is hands down the BEST ice cream flavor ever. Gourmet Ice Cream! 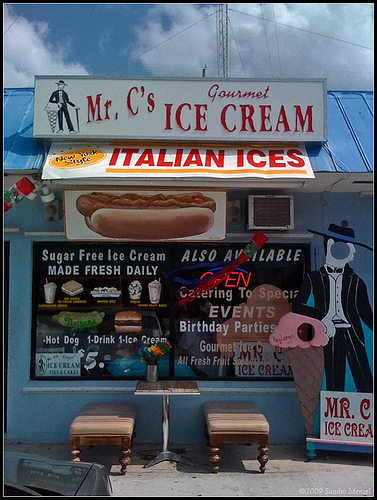 Mr. C's has the best home-made ice-cream, made with pure and natural ingredients - No corn syrup - No preservatives. Just pure ice creams, sorbets and gelatos. Sugar Free varieties are also available and they make shakes, sundaes and banana splits. They have more than 24 flavors, such as chocolate oreo, Nutella, Peanut Butter Reeces Cup, Cookie Mint, Mango-Orange Sorbet, Lemon Italian Ice and many more. When Chuckie started getting very sick, we decided he really needed one last hoorah and made a special trip to Islamorada. I have to say Sands of Islamorada Resort was the most amazing place we could have taken him to. I previously walked by and saw the adorable dog statue out front, and made a mental note as I love to keep track of boobah friendly resorts. 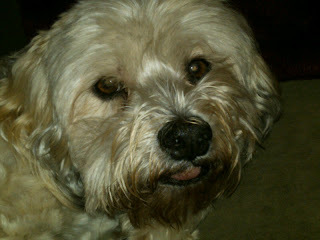 Sands was above and beyond dog friendly - Chuckie made his way into others rooms, and it was no issue! Other dogs were in our room, no issue! Dogs on the beach, no issue! It was just the chill atmosphere Chuckalicious needed to enjoy his last vacation. It was peaceful when we needed it to be, fun playing with other boobah's when Chuckie was up for it, bbq grills on the beach -- Chuckie was lovin' it! Chuckalish really sucked it up and made sure he enjoyed the vacation -- he really knew we were there for him, and made sure to make the best of it. 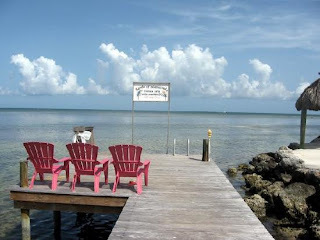 Oceanside lodging w/Keys flair. In-room phone/modem. When we got home it was the beginning of the end. It was devastating. I had much false hope - praying that as happy as he was in Islamorada would continue when he was home. G-d had other plans. Chuckie was the bravest little man, he fought the hardest fight, but, it was time. One of the best decisions I made was to have my baby euthanized at home with Sloane Robbins from Goodbye At Home - the most humane and kind woman I've ever met. Sloane came to my home, let me lay with Chuckie until the bitter end. I was able to lay with him during his last moments, not in the vets office (which he frequented weekly for the last 3 months of his life) - he was in his bed. with his blanky and his mommy hugging him. It's by far one of the most depressing days of my life - but, I'm grateful that we were able to say goodbye in the most dignified way possible. A friend emailed me the "Rainbow Bridge" poem copied below, it brought solace to my heart, and for those of you who have lost a cherised pet - I hope it does the same for you. These were my last words to my boobah -- I hope you can get a sense for just how special he was. You talk to grandma and daddy – you’ve told them how excited you are to be with them. I only hope you truly know how much I love you. You’re my first boobah, my most special boobah, and you will always hold such a warm place in my heart. You’ve taught me so much. How to love unconditionally, how to be a mom, how to put someone else first, how to grow as a person and so much more. I am so thankful to you. You walked into my life when you were 7. Our time together has been way too short. I hope you know how special you are. You’ve touched so many lives with your human like eyes and heart. When grandma had surgery you were right by her side, being the amazing therapy pet you are. You know when you’re needed, and assure you are there, front and center, to make someone feel better. You were always the doggy police at the dog park. When a fellow small dog in need hollered, you were there, barking up a storm, standing between the mean doggy and doggy in need, stopping any bad incident from occurring. You were also the doggy welcoming committee at the dog park. No new dog should go through the park without you getting a good sniff first, you were kind like that. A warm and fuzzy and smelly hello. You were kind, you were gentle. You were sweet. You were loving. Some nights I even got you to cuddle too! You were terrified when you first showed up on my doorstep and realized you were there to stay. You trembled, and I was so excited to see you and learn you were mine, I didn’t notice how scared you were. I knew then and there that I’d always be there for you, and fight for you to the very end, I was in love with you from the very start. It took you eating away all of my wood door frames to realize you were worried, scared, afraid of new surroundings and were unsure of whether I was there to stay. I woke up and realized you needed reassurance and off to doggy obedience school we went. School was really for me, not you. You were already smart enough to sit, stay, and make me fetch. When grandma and grandpa came to class to watch you, you gleamed with pride as you followed all the right commands, you were so proud to see grandma notice how great you were. School was really there to teach me how to let you know I was there to stay, you could trust me. And after our year of school, it worked, you realized I was in it for the long haul, I was head over heels in love with you. You have a wonderful inside, warm, fuzzy and full of love. You’re smart, not just anyone gets a huge chunk of it, you have to earn it! Grandpa made a big stink when I first got you (little did he realize he’d want you sleeping in his bed soon enough). He wasn’t sure what kind of boobah you’d be and didn’t want the responsibility. You warmed his heart like none other. You’re sweet disposition, your kind soul, you touched grandpa in no time. Grandpa was your numero uno quite quickly. Grandpa took you for afternoon walks, and gave you all those great treats and human food mommy wouldn’t have, no wonder you made sure to quickly get up and follow grandpa whenever he moved around the house (just in case there was a treat in it for you). You were smart enough to walk grandpa to the kitchen at times, just in case you thought he forgot about your treats. Soon grandpa was calling for chuckie updates and head over heels for you as well. You do that to people. The way you got out of the elevator and sprinted like you were in the biggest race of your life to grandma and grandpa’s door and wagged your tail so hard it would have hurt to be standing next to you was priceless. You were so excited to see grandma and grandpa, nothing would get in your way. Then you learned how to knock! After all, mommy wasn’t running with you, so you spent all this time at the door, you could have spent inside, eating with grandpa! You learned how to pick your paw up and knock. It was the cutest thing ever. Grandpa has the adorable paw marks he continuously asks me to remove. Then, daddy came into your life. You know you were always my number 1, but, you were unsure who this man was occupying so much of mommys time. The first time daddy watched you he took you out for this nice long walk around bayside, you weren’t having it, no pees or poops for you. But, as soon as you got back inside the condo, what’d you do? Peed in front of daddys neighbor’s door, yep, you showed daddy who the boss was. Little did you know daddy would warm your heart and turn you around and you’d soon be whipped. You learned security and comfort with daddy. You went from trying to hump him and peeing on his neighbors carpet to show him who was boss, to sleeping between his legs and doing anything you could to get a pet from daddy. I have the cutest picture of daddy sleeping with his hand to the side, and you jumping up on the bed, and crawling UNDER his hand, just so you could be held by daddy. It was the same story when daddy was sleeping on the couch, he had his arm down to the side, and youd crawl under his hand to be held by daddy. You would play, run, and go for wonderfully long walks with daddy. Daddy even taught you how to take treats straight from his mouth (he ate his fair share of doggy treats as a result). Mommy and Daddy took you to Islamorada for vacations. After all, whats a vacation without the boobah? We both fondly recall the first time we took you to chesepeake. You were in doggy heaven. You sniffed and sniffed and sniffed away. You couldn’t get enough and were sooo thankful you were brought along. We since took you back a couple more times. You’re always so sad to see suitcases, or me packing, but, the look on your face when you realized you were coming with me, oh my G-d, it warmed my heart like none other. It was priceless. You were ecstatic. About 3 months ago I took you to the vet for a teeth cleaning and wart removal – you hated your warts and I wanted them gone for you. The doctor did some blood work, a normal pre-op procedure to assure you’d be ok with going under for this. The bloodwork came back stating you had anemia and a low platelet count and the procedure was off. Little did we know our bouncing chuckalicious wouldn’t be the same. I feel horrendous having to give you so many medicines for so many months. We’ve had weekly trips to the vet, and weekly blood tests to monitor your progress. I couldn’t and wouldn’t give up on you. I know your zest for life. I know your desire to be there for your family, to make sure all of us are happy and keep an eye on everyone, by always strategically placing yourself in the middle of the action. This is the hardest day of my life, I’m never going to be ready to let you go. I’ve continued to make you keep fighting, keep taking meds, stay strong for all of us who rely so heavily upon you for the comfort and love you provide. I’m so glad we were able to recently take you to Islamorada again. You’ve had such a rollercoaster of a ride this last 3 months. You’ve had good days and bad, but, the bad days were slowly becoming worse. Not eating, not walking, none of the normal zest for life were so used to. Islamorada got you back in the groove, so much so we wouldn’t leave on time, we stayed an extra day. It was worth it to see you so happy. You roamed free, with no leash. You went into other doggies rooms. You ate whatever you wanted, daddy cooked lots of yummy food for you. I’m so glad you had a last hurrah, we needed to see you happy. I wish you could speak. I wish you could tell me I’m doing right by you. If you’re ready to continue the fight, I’m here to hold you and fight with you forever. If I need to let go, and let you move on, I wish you could tell me. I guess you’re showing me, but, its so hard for me to picture life without boobah, my chuckie, my chuckipoo, chuckalish, boobalish, my boobalicious, my chuckalicous, daddys boobah mcschlufkin, grandpas chuckalon and inspector chuckie, you have so many names because you’re so loved by all who really know you. I love you so much. I want you to be healthy and happy. People always asked how old you were, they were shocked when the answer was 12, 13, 14 – you acted like a puppy always. Such zeal, strength and happiness you portrayed. I’m not sure what life will be without you, but, its time to let you go. You’ll meet gammy, grandpa and Robbie in heaven – I’ll make sure they watch out for you too, but, knowing you, you’ll warm their hearts and be the one watching out for them in no time. I’m going to miss not coming home to you – but, know that its ok to move on, you’ve fought so hard, its your time. I love you, and always will. Just read this post. So sorry for your loss. Yes, our furry ones are indeed our children. I have a doodle daughter (Maya), and yes, she may look different from my friends' daughters, with her furry head and long nose, but she is the best daughter I could have ever asked for! (I have twin boys (of the human kind)too. May Chuckie rest in peace. Thank you, Paula. 4 legged kiddos are so special, (in my opinion, better than the 2 legged ones!). I miss Chuckie very much. Enjoy every minute with Maya - and if you have the opportunity, take Maya to Islamorada - you'll both LOVE it!! What a wonderful story, pets should be treated like part of the family.